The city is ordered to do more to secure the leaking landfill, and to stop or reverse some of the initial repairs. Atop the city landfill in August, Kim Rich of Portland examines trash protruding from what she thinks may be a hole in the cap of clay and soil, which is supposed to be at least 2 feet thick. That’s one of several problems the city is fixing to get a permit to install a solar array, but it’s running out of time to qualify for higher reimbursement rates on power fed back into the grid. The state has ordered Portland to do more work to secure the city’s leaking landfill before Maine’s largest city can move forward with its solar farm installation at the Ocean Avenue site. The state also recently ordered the city to stop or undo some of its repairs at the site because the city had not fully tested soils spread on the hill and because a newly installed fence might have caused more damage to the landfill’s cap. A sign at the base of the capped landfill off Ocean Avenue warns people to keep their pets out of the standing water. Many pet owners allow their dogs to run off-leash near the landfill. The latest problems are not causing direct health hazards, state officials say, but are adding to the costs and delays as the city scrambles to repair the aging landfill in time to install solar panels there before the end of the year in order to be grandfathered in under the current rules governing reimbursement for power fed back into the grid. The reimbursement rates are set to be gradually phased out for arrays that go online after Jan. 1. The Maine Department of Environmental Protection says the city must increase the height and slope of the landfill by 3 feet, and then over the next year, conduct a comprehensive assessment of the landfill cap and fix any areas where the cap is not 2 feet thick. Some areas are so thin that garbage is popping up through the surface. The scope of the work makes it unlikely that the city will meet its goal of installing a 4-acre solar array on top of the landfill by the end of the year to take advantage of higher electricity rates for solar customers. At a minimum, the slope on the landfill, as well as the venting of methane, will likely need to be addressed before the DEP will issue Portland a permit for roughly 2,800 solar panels, which are expected to generate enough electricity to power City Hall and Merill Auditorium. Portland’s project has fallen behind South Portland’s solar array installation. Both communities approved their contracts with ReVision Energy on Feb. 22. South Portland’s 2,944-panel solar array was activated Oct. 17. But Portland’s isn’t likely to be finished until next year. 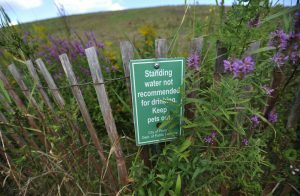 Portland has installed new fences next to its former landfill to keep people and pets away from leachate escaping from the site. Other sections of fencing were recently ordered removed by the state because the posts could cause damage to the landfill cap. 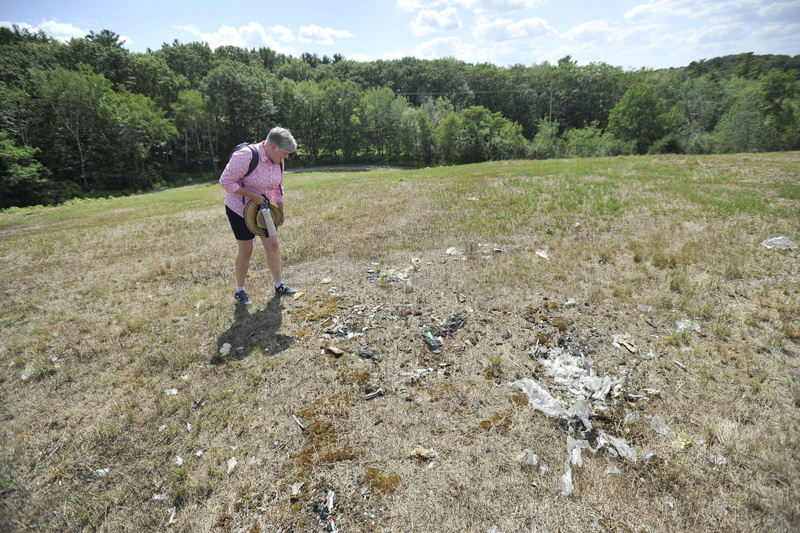 The Maine DEP inspected the Ocean Avenue landfill Aug. 30, two days after the Portland Press Herald published a story about conditions at the landfill, which the city had neglected to maintain over the years, allowing rooted vegetation to grow there. The story included photographs showing trash that appeared to be emerging from the ground. Matthew Young, project manager of the DEP’s landfill closure and remediation program, said he was surprised to see the exposed waste in the photographs. He said those conditions were likely missed during previous inspections because of the long grass. And he also said that it’s unlikely that the trash resulted from illegal dumping. “I definitely found a hot dog wrapper on my first test pit and that looked ’70s vintage,” Young said. The Ocean Avenue landfill in East Deering is rimmed by trails maintained by Portland Trails. From atop the 50-foot mound, one can catch a glimpse of Casco Bay. It is near the Quarry Run dog park, and many pet owners allow their dogs to run off-leash along the road that surrounds the old fill. New fencing was installed to keep people and pets away from leachate that seeps out of the landfill. In working to address the environmental concerns, city officials have stumbled in efforts to increase the landfill’s slope to prevent water from ponding on top of the mound. The ponding causes contaminated water to leach from the bottom of the landfill, which can be a health hazard to animals that consume it. The city had planned to use dirt excavated from the State Street construction project to regrade the slope. Crews already had spread about 700 cubic yards of fill on top of the landfill before being ordered to stop by DEP officials. The stop-work memo was issued because the city had not provided the proper scientific tests to verify there were no poisonous materials in the fill. 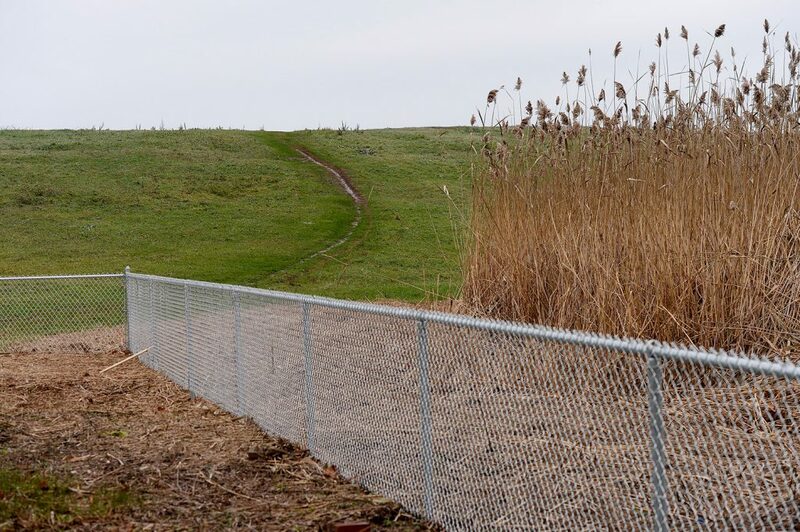 The city also was ordered to remove a fence that it installed to prevent people from walking on a well-worn trail on top of the landfill, because the fence was installed on the landfill cap. Chris Branch, director of Portland Public Works, said the city is now trucking in a clay-heavy fill from Gorham to cap the landfill. That has increased the capping cost by $70,000, to $220,000, he said. Another $70,000 will be needed to install seven vents to get rid of methane that was discovered at the site, but Branch said most of that cost will be reimbursed by the state. It’s unclear how much more work will be needed to fix the rest of the landfill, including the areas that have exposed waste. Young expects the state to issue a draft permit for the solar array sometime next week. Then, after a week-long comment period for the city and the public, solar panel installation could begin. The city will have an additional year or so to fix the rest of the landfill to ensure there is at least 18 inches of compact clay cover plus 6 inches of topsoil, Young said. But after the comment period, there won’t be enough time to finish installation before the end of the year, said Fortunat Mueller, co-founder and managing partner at ReVision Energy. He said it would take 10-12 weeks to install the solar array once the city receives its permit. ReVision originally estimated that the array would begin turning a profit in 10 years, and possibly net the city $3 million over the 40-year life of the project. 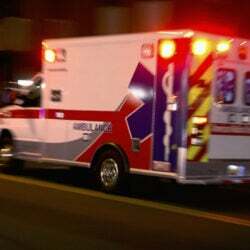 However, a third-party review by California-based Strategen Consulting was less optimistic, saying the best-case scenario is for $500,000 in the first 26 years. City officials said they could not estimate how much missing the deadline would affect the project financially, but Mueller said that it would only reduce its financial projection by 1 percent, or $30,000. Both ReVision and the city downplayed the importance of getting the solar project online by Dec. 31. “We (and the city) are focused on building a great solar system for Portland that yields a solid economic and environmental return on investment for taxpayers, not on an arbitrary end-of-year project completion target,” Mueller said in an email. There’s a lot riding on the landfill work besides the city’s ambitious solar project. In addition to addressing negative environmental impacts of the leachate, the city recently amended an agreement with Kenyon Energy, the company that will assume ownership of the solar array after it’s installed by ReVision Energy. The city plans to purchase the solar array at some point, but until that happens it will be paying a premium for the electricity. If the solar array has to be taken offline or removed because of problems with the landfill or other regulatory issues, the city would be liable for the costs of any electricity that would have been produced. Correction: This story was updated at 9:31 a.m. on Nov. 14, 2017 to clarify that the city was ordered to stop or undo some repairs.